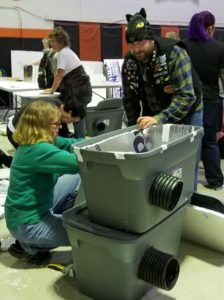 On November 3rd, Philadoptables and Catadelphia joined forces to host another cat shelter building workshop. Participants learned how to build these awesome winter shelters and then took them home to place in their communities for homeless kitties. Over 200 shelters were built at this event!